Yes, after Wheeljack, Bumblebee is the second character to appear in the cartoons. In the first episode, he transformed to basically a Volkswagen Beetle without the wheels and wings. Like Wheels, "Bumble" was on the ark when it crashed onto earth millions of years ago. 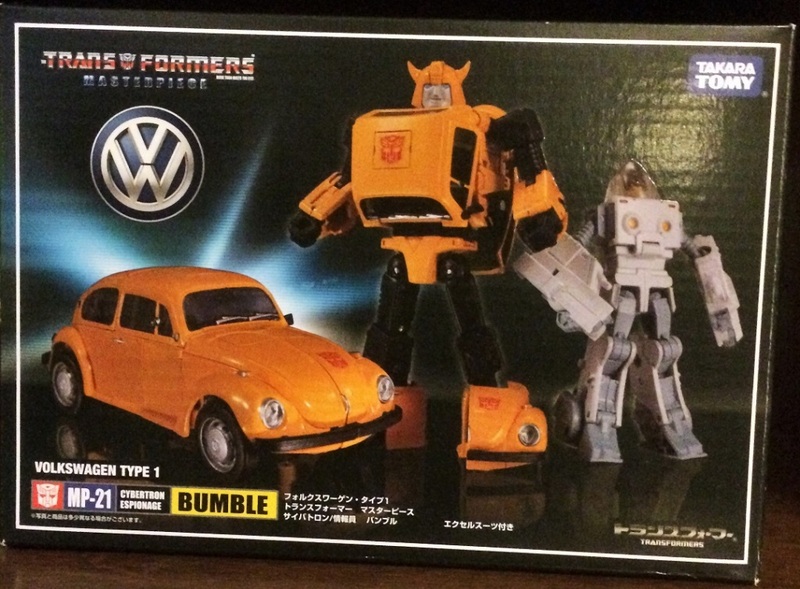 After being waken up by Teletran I, Bumblebee transforms into a Volkswagen Type I beetle. He is also best friend to Spike Whitwickie and his son. Unlike Jack or OP, thankfully, he survived the "Great Toy Wipeout" of 1986 (The movie) and became friend with Daniel-san. (Sorry I have to go there do I?) Becoming "Goldbug" eventually near the end. Other than OP, Bumblebee became one of the fan favorite Autobots. So much so that for the live action movie, he was one of the first character quickly drawn up and included in it. Despite the great "movie purge" (read Transformer 4), Bumblebee survived like the Great Toy Wipeout. Sadly (not so sadly now I guess cause the old Beetle just will not fly for the movies), movie Bumblebee alternate mode have been and now will always be a yellow Chevy Camero with two black racing stripes. Well, there is an extra wheel, a smiley face for Bumble and his gun. Other than that, it's Daniel in his exosuit. This suit first appeared in the movie... Then like a lot of things, just disappeared. In the movie, Daniel-san piloted this suit, transformed into a wheeled spaceplane (why would a spaceplane needs wheels...Ohh wait, toys toys toys, we gotta sell toys! Gotcha!) and saved his dad, Bumble and the rest from having a real case of digestive meltdown when he used the lasers on the arms to free them from Unicron's digestive tracks. Following the instructions carefully, the suit transforms into that weird spaceplane with wheels. Some of the moves are pretty convoluted. But than again, this is a MP figure and being "convoluted" goes with the territory. Just becareful with the two arms. Just a tad touch will separate them from the elbow socket. Guess they are designed that way since there are some heavy and convoluted bending and twisting going on here and it does no good having the arms break permanently. All in all, both the primary and alternate looks great despite the fact Daniel-san is blind. After some slight twisting and bending, Bumblebee transforms into the yellow robot we all come to love. Again, due to slide-molding, his facial features is something to behold! well detailed and well defined! The only problem is the rear bumper. It's designed to fall off at the slightest touch and well, you will loose it if you are not careful. Like Wheels again, I did not insert the rearview mirrors....That is, if you have a real dire wish to feed the carpet monster or something, which I do not. The only other thing to watch out for is the front hood. You need to lift it to free the front compartment/feet. It goes into a slot in the stomach area. Just make sure you are careful and not break it off. 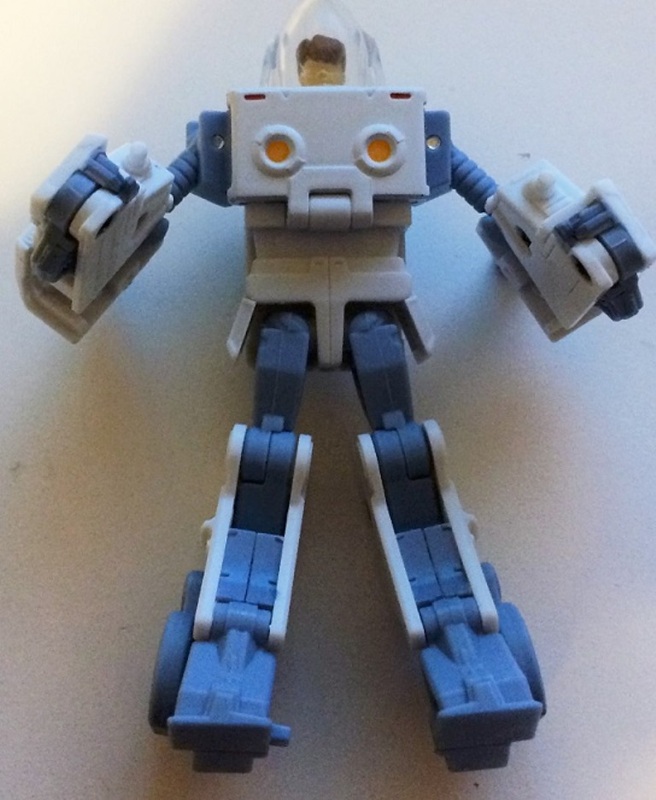 Otherwise, bumblebee looks just like the cartoon counterpart, with no less than 26 articulation points. Now, the spare wheel, it goes on the back of the car/bumble. Why is it there I don't know cause I don't remember the cartoon bumble ever had it (although with that many episodes...) so comics? I don't know why it is there. The other big gimmick is like Starscream, Bumble can change his face from a serious one, to a smiling one. Unlike Screamer though, you have to pry the old face off and insert the new one. Again, find some place safe cause this part is rather small. Bumble's alternate mode is the Volkswagen Beetle, the old one from way back to before the start of WW II, when Dr. Ferdinand Porche first presented it to one Adolf Hitler.....After that little disaster and then some, when Germany was trying to resurrect its economy, Someone got the grubby mitts on the original plans, and Volkswagen (the name of the car company sponsored no less by the tyrant himself) promptly made it and sold it world wide, including the States. At first everyone just laughed at it. Back in the 60's when it first came out, America is in love with big beaters like Ford and GM's. Everyone felt something that tinnie, low horsepowered will have no place on the American road. But how things turn and how wrong they were...It turned out, with a price so much cheaper than those big American beaters, and fuel savings, it was the perfect car for college kids, grads, and people who just found their first job and could not afford a big beater. For many young American, their first car, the first car they can afford, was a Beetle. And with its cute looks, it even became a movie star as "Herbie" . By the time Transformers came out, especially with the oil crisis of the 70's, the Beetle became more popular than ever with the last one finally came out off the assembly line in Mexico 2 years ago and this is the original one! So it just seems fit to have Bumblebee transform into one! In car mode, the Beetle oozes as much details as in robot mode. It's a tad longer due to the robot issues but there is no mistaking this is an original Beetle. Detail fidelity is sharp, what with the handle on the trunk (which is in front. The original beetle had its engine in the rear) tail and head light all there. Since this is an MP, and it has the Volkswagen official license, the VW symbol is prominently on the hubcaps. Overall, the car looks just as good as the robot. The only problem is the front wheels. Due to the fact they fold in when transforming to become Bumble's footpads, they kind of will collapse if too much pressure is put on it. But that is a minor quibble in otherwise a great package. Transformation: 8. All very easy to figure out, for both figures. Durability: 8.5. Again, like all mini MP figures, metal pieces are nonexistent but still, pretty durable provided you don't bend them too harshly. However, just beware there are some pieces, namely the arms on Daniel-san and Bumble's rare bumper can be easily knocked off since they are designed that way. Fun: 8.5. Pretty low cause, well, I'll just let one of my attached pics tell the tale. Both of these figures are small. Compared to other car series like Wheels or one of the bigger MP figures such as Soundwave, Bumblebee is small. And remember, Daniel-san is even shorter than Bumble so it kind of pinch the fun factor. Playability: 9.0 At least the playability is high since both figures are articulate and posable, especially since Bumble's face can be changed. Price: 8.0 UGH! I don't care if you get it straight from Japan or from stores like BBTS so as to avoid the hassle, the price can be seriously off putting. Again, this is mainly due to the small size of these figures and weight, only 0.3lb for the whole entire thing! Overall: 8.8 Score mainly brought down by the small size of the figures, lack of any worthwhile accessories and weight. 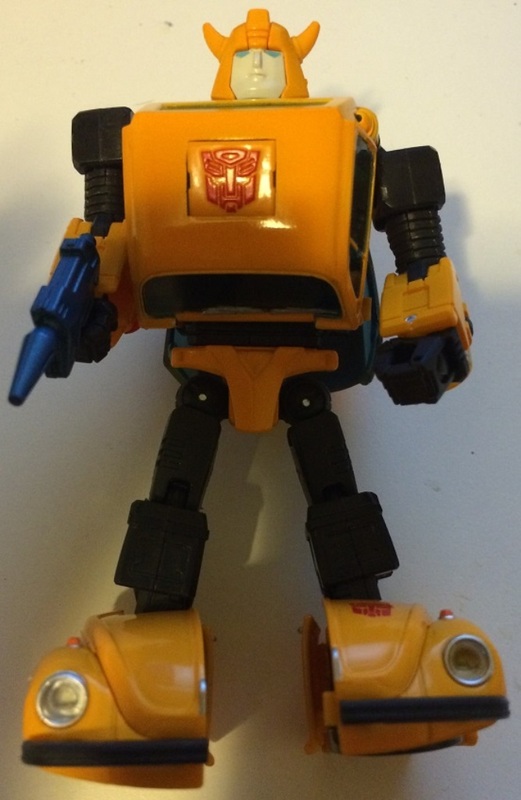 But still, if you are a fan of Bumblebee, this is one figure to get cause it's a dead ringer for him from the original cartoons.